Do you know vape? then you know very well about vaporizer. E-cigarettes and dry herb vaporizers are gaining popularity in now a day, as vaporizers pose few long-term health risks as compared to smoking (according to a cancer research UK). This is the reason smokers and cannabis users are adopting vaporizers to tailor their lifestyle and need as burning weed is hard and time-consuming also has become an old method. People preferring weed vaporizers as to update their lifestyle as it is the safe method also it doesn’t rip your throat with every hit. In today’s article, we will be sharing some top 12 best weed vaporizers which are top rated in the market in 2018. 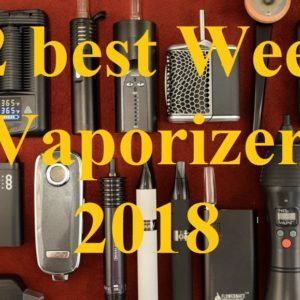 Here are the quick reviews of all the top 12 best weed vaporizers 2018. Da Vinci IQ is the most preferred weed and dry herb vaporizer in the current markets of 2018. As the design and looks of this vaporizer is amazing but also it performs simply amazing. It is so simple for newbies to use as its function are quite simple. This vaporizer is built from premium materials, and the zirconia air path keeps the vapor cool also produces thick vapor with rich flavor. It also allows the users to customize the temperature with the help of patented smart technology for optimal sessions. Not only this, this vapor has also Bluetooth technology and a smartphone app, which the users can also control their vapor with the app. It is suitable and perfect choice for technology savvy and new gadgets lovers. Also, it comes with a replaceable battery. This vaporizer comes with the price range of $274 in the market. The PAX 3 is the smart and sleek weed and dry herb vaporizer. not only it has eye catchy design also offers a slew of high-technology features which includes Bluetooth feature, smartphone app feature. Also, it has the lip-sensing technology, which efficiently works by activating heat when the user brought the vape close to their lips and cools when the user removed the vape. also, it has upgraded battery 3500mAh battery. Overall it is an amazing device with so many features. This vaporizer comes with the price range of $249. The Arizer Solo 2 or Air 2 is the new spin which has introduced the new features an updated feature which includes the LED display for more efficiency and thus made the use of vaporizer simpler and easier. Hence Solo 2 vapor is large for weed and dry herbs, but the performance of this vapor is exceptional in terms of quality. And the Air is smaller and Argo is the smallest ones. But all the products are great in performs and highly portable and top notch. As Arizer’s products don’t even require any maintenance. It comes in the market with the price range of $239.99 or $ 249.99. The Firefly 2 has also won the two categories of the best flavor and the best Solo vape. the manufactur of this vapor has used a unique convection of heating system, it simply means the heat source does not come in a direct contact with the weed and dry herbs. Which allows the users to take draws and saves the rest of the herbs for later use, hence which makes it a convenient feature. This vapor has a premium-quality of glass vapor path and convection heating which makes the flavor unparalleled. Due to its features, quality and design make it an overall best vapor. This vapor has a price range of $329 in the market. This vapor is futuristic and has a dual-user that supports dry herb and it also concentrates. The Ghost MV1 vaporizer first provides on-demand heating as desired by the user with its convection heating process also manages to keep the vapor cool with its pronounced flavor. This vapor works for semi-advanced users who likes the versatility and appreciates the latest premium vapor gadget. The only minor drawback of this vaporizer is that it is not as simple as other vaporizers on this list. It has the price range of $ 295 in the markets. Crafty and mighty are the new two beasts in the market of 2018. They are both highly portable and impressive to carry around anywhere. The mighty has the double battery life feature and whereas crafty has eight sessions of use feature. Which means you can use up to 80 minutes. These both are manufactured by the company Storz and Bickel, which is a Germany based company. This vaporizes are best and highly preferred for a group user. It comes with the range of Crafty ($279) and mighty ($349). The G pen ELITE has a sleek and ergonomic design which makes it a well balanced while holding it or using it. It has a simple hence efficient interface which allows a precise temperature control also it has an LCD display screen which makes it easy to use. It has a deep ceramic oven with 360 heat temperature which provides a strong and potent vapor. This vapor is easily available in the markets also comes with the various collaboration versions with other companies such as Burton and Badwood. Due to this reason, this vapor is considered the most popular vaporizer out in the markets. Also, it has a great price of $99- $149. This vapor is the best choice for those who love an all-in-one device for e-liquid, wax and dry herb. The device comes with two cartridges: e-liquids and dry herb while for the wax component you need to order it separately. The cartridges and the charger connections have easy and hot-swap magnets which makes it simple to use. All you need to do is to put the parts near one another and the rest of the work will be done by the magnets. These vapor works really well that is the reason it is included in this best vaporizer list. It has a price range of $129 in the market. This vapor is a simple point and shoot vape, means there is no need to turn on and can be used quickly with any customization of mobile application connectivity. It has an amazing size ceramic oven for personal vaping and also the quality is highly appreciated. Thus, the draw resistance is minimal, due to this it produces a lot of vapor even with short draws. Also, it has a smart price and simple in use which makes it a perfect choice for the beginners with the price range of $129. Pulsars are the best choice for the vaping enthusiast on a budget. With a low-price range of $70 it has so many features and provides a quality vaping experience. It takes just 30 seconds to heat up and also have a standard battery which lasts up to two hours. This vaporizer provides you the amazing experience vaping dry herbs with the quality of its design. The only thing which makes it an eye catchy is the appearance and design of this vapor, as it is a handcrafted wooden vaporizer. it has several other features too, as it heats quickly. It comes with the price range of $119 on the market. If you are looking for the best quality and standard price range ofvaporizer then the Xmax starry vaporizer will be the best choice for you. it has a low and standard price range but have many quality features such as it has a full temp spectrum and replaceable battery, it light weighted and pocket carry vaporizer with digital display also the company gives you the one year of manufacturer warranty. Its price range is of $99 in the market. All these vaporizers are considered as the best vaporizer due to the top-rated customer’s reviews in the market. Before buying any of the vaporizers make sure you search for more reviews from different websites about your desired product.